Whoever thought about purchasing a Tesla and was only put off by the short travel radius of only 400 kilometers might want to reconsider. Only two months ago, the Dutch gas supplier and new energy solutions company, Holthausen Clean Energy, announced that it has developed Hesla (“Tesla with a twist of Hydrogen: “H=ESLA”) which will supplement the popular electric vehicle with an hydrogen power source, and transform it into a Fuel Cell Electric Vehicle (FCEV). The technology will revamp Tesla’s short distance capacity and more than double its travel range from 400 to 1,000 kilometers. In 2000, when the brothers Stefan and Carl Holthausen took the gas supply company over from their father, which was started by their grandfather in 1945, they were concerned about the future of the family business. Stefan Holthausen remarks, “How do we keep the company going until 2045? Then we have to change and evolve”. He also applied the same question to the future of our fuel supply. The three-generation family-operated company is located in the Hoogezande, Groningen in the idyllic surroundings, which ironically are near the epicenter of Groningen’s recent earthquakes and tremors. The earthquakes have been induced by the country’s extensive exploitation of natural gas fields under the province for the last 50 years. Holthausen is specialized in producing emissionfree solutions for commercial and private use, and recently developed the technology to install and supplement a hydrogen fuel engine into the electric-operated Tesla vehicle, which normally takes anywhere between 15 and 45 minutes to recharge at a fuelling station. However, the technology of the Holthausen’s Hesla can completely recharge in less than three minutes. Stefan and Carl Holthausen first got the idea to switch to hydrogen, was first ignited when the two visited the first hydrogen tank station in Munich in 2007, which was a test case for BMW. They both thought, “This is the future”. However, the idea to develop a hydrogen fuel cell for the Tesla came from Carl’s 18-year old son Max Holthausen. Today Stefan Holthausen believes that a hydrogen fuel cell is a logical solution for Tesla’s short-range problem. As a company, Holthausen has experience with sustainability and for seven years had already been producing hydrogen cell fueled vehicles. For the city of Groningen, Holthausen developed hydrogen fueled street sweepers, buses, and trucks. According to the engineer, hydrogen cells will increasingly become the ideal method for balancing solar and wind energy. He emphasizes that with the current plans for 45,000 wind turbines in the North Sea, there will be an enormous energy surplus. Yet that energy will only be delivered when the sun is shining and wind is blowing. In order to avoid a drop in the power supply and blackouts, the electrical grid needs a constant balance between the electricity supply and demand at all times. 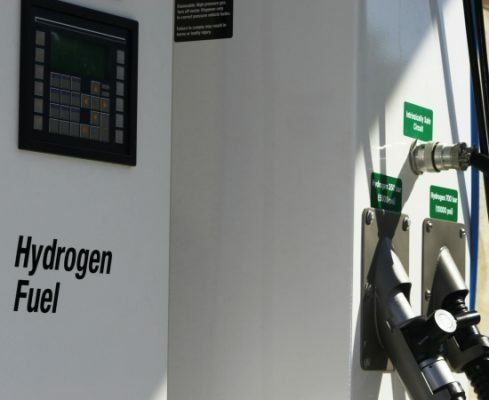 Holthausen adds, “That’s when hydrogen power balances the system, and renewable energies can be converted to hydrogen fuel cells”. Unlike the conventional fossil-fueled automobile, the hydrogen-powered vehicle does not have an internal combustion engine and is powered by fuel cells. The hydrogen becomes converted into electricity, which operates the car. The car is essentially fueled when hydrogen gas is released during electrolysis of water, which is the chemical process that uses direct electric current to cause a non-spontaneous chemical re- action. When the car is operating, H20 (water) splits into 2 parts of hydrogen and 1 part oxygen, and energy is released. Unlike the combustion engine, which during this process releases nitrogen (N2O), water (H20), and carbon dioxide (CO2) into the atmosphere, the hydrogen operated vehicle only emits distilled water (H2O). The hydrogen conversion for the Tesla costs anywhere between € 60,000 and € 70,000, plus the price of a Tesla vehicle, which can range anywhere from € 78,000 euros for a Model S 60 to € 140,000 for a Model S P90D. Despite the high cost for the Tesla, the demand is still on the rise in the Netherlands. In 2017, more than 3,300 Tesla Model S vehicles were sold in the Netherlands, and more than 101,000 Tesla Model S and X’s were purchased world-wide, which is a 33% increase from 2016. 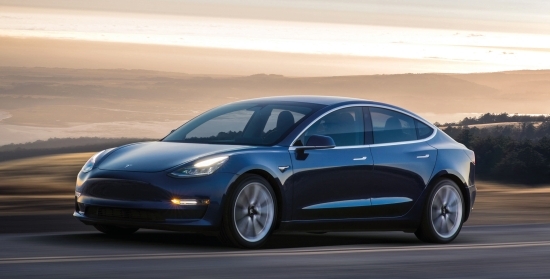 While other car manufacturers aim to launch their EV in 2020, Tesla continues to dominate the EV market and plans to produce 5,000 Model S vehicles every week by the first quarter of 2018. Stefan Holthausen, however, believes that the EV car manufacturer will not be that enthusiastic once it hears about Holthausen’s hydrogen fuel conversion for the Tesla. The conversion still needs to be approved by the Netherlands Vehicle Authority (RDW), but Holthausen is optimistic and anticipates the first hydrogenpowered Tesla to be on the road in the Netherlands sometime in 2018. In the meantime, Holthausen is active and has been commissioned to install the first hydrogen filling stations in the Netherlands. Today, there is only one filling station, located in the city of Groningen. For the production of emission-free street sweepers, Holthausen has already had several orders from abroad, including the state of California, whose lawmakers have far-reaching steps to reduce greenhouses gases than the US federal government. In September 2013, the Californian governor, Jerry Brown helped pass a state law that earmarks up to $20 million dollars a year to support continued construction of at least 100 hydrogen fuel stations. In 2018, Holthausen will develop hydrogen-powered trucks and an airplane for Airbus. According to Stefan Holthausen, “We are standing on the doorstep to a new economy that will be fueled by hydrogen. In the near future vehicles and trucks, but in not too far future the same technology can be applied for fueling houses. The future looks bright”.